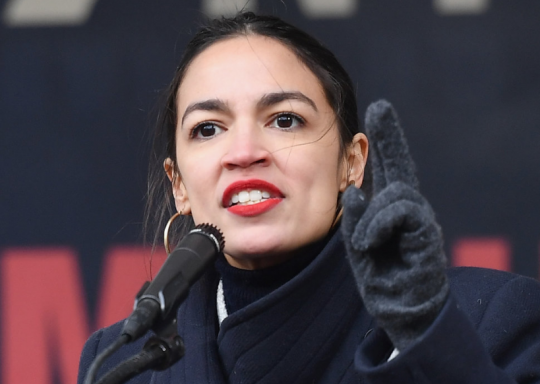 Rep. Alexandria Ocasio-Cortez (D-N.Y.) made a factual error Thursday when explaining a factual error she made while defending herself from a Washington Post fact-check that found she made several factual errors. Ocasio-Cortez's war on fact-checking began weeks ago when she was given Four Pinocchios for her claim that the Pentagon lost $21 trillion in funds, and those trillions could pay for her Medicare For All proposal. This was laughably wrong—the combined budget of the Pentagon for its entire existence doesn't break $21 trillion. The Four Pinocchios, WaPo‘s worst rating, was awarded after she doubled down and kept the false tweet up. Round two began Wednesday when she preemptively tweeted out a rather absurd strawman attack on the idea of fact-checking along with a now-deleted tweet complaining about "overzealous fact-checking sarcasm and hyperbole." Next day: "That will be TEN PINOCCHIOS to Ocasio, ‘zillion’ is not a number and I found someone who sleeps in a tent, not a car." Unsurprisingly, another WaPo fact-check dropped the following day. Despite Ocasio-Cortez's hyperventilation, reporter Glenn Kessler focused on what was rather obviously intended to be hard statements of fact. "I think it’s wrong that a vast majority of the country doesn’t make a living wage, I think it’s wrong that you can work 100 hours and not feed your kids. I think it’s wrong that corporations like Walmart and Amazon can get paid by the government, essentially experience a wealth transfer from the public, for paying people less than a minimum wage." Kessler found three errors, giving her Three Pinocchios. It is not true that the "vast majority" of the country doesn't make a living wage. Walmart and Amazon do pay their employees minimum wage. The last error is a bit more wonky, but Kessler ruled that it is a misunderstanding of economics to believe Walmart and Amazon "experience a wealth transfer from the public" because the government pays for their employees' housing, food stamps, etc. To understand why, suppose that the government suddenly cut you a check for $100,000. How much would your wage change? The answer is not at all—employers don’t care about your cost-of-living or financial situation. Rare too is the employer who would respond to the government raising your taxes by selflessly bumping up your wage. It doesn’t make sense to talk about Walmart being "subsidized" by government handouts to workers, because ultimately raising, lowering, and eliminating those benefits doesn't change how much Walmart spends on labor. Feel free to disagree, but ultimately Ocasio-Cortez took issue with something else entirely. When explaining the theory, Kessler linked to an academic paper by NYU professor Jason Furman, hosted online by the pro-free market Mackinac Center for Public Policy. But—aha!—Mackinac received money from the Walton family, the owners of Walmart. Even if she were right, this is a textbook example of the genetic fallacy, with a little bit of circumstantial ad hominem to boot. That a study was funded by Walmart or the author stood to gain financially does not address the actual substance of the argument. Kessler might be citing the fox to fact-check the hen, but maybe the fox is right and the hen is an economically illiterate demagogical bully. As it happens, Ocasio-Cortez wasn't right. Furman was the chairman of the Council of Economic Advisers under Barack Obama and wrote the paper for the left-wing Center for American Progress—Mackinac just reposted it online. Furman has never received payment from Walmart of any kind, which Ocasio-Cortez should've realized given that the very first page reads, "The author has never received payment from Wal-Mart of any kind." Ocasio-Cortez apologized and … ahahahaha, no. She doubled down. By citing Furman, she tweeted, WaPo was legitimizing "revolving-door politics" where people left government "to collect a lobbyist check." Furman has never been a lobbyist. He's just an expert who happens to disagree with Ocasio-Cortez, who still has made no effort to defend the substance of her original claim. Her response to yet another inaccuracy was to apologize—you know, if you misunderstood her—and insist she was still in the right, because there was a possibility he was a lobbyist. I am criticizing the rationale of saying we should trust a questioned source paper because of a standing friendship and X admin, bc neither preclude the possibility of revolving door politics – if the tweet read as though I was going after @jasonfurman specifically, I apologize. It's really never-ending with her. The same day as these tweets, Ocasio-Cortez tweeted of Lindsey Graham that to him, "the President failing to condemn neo-nazis … is whatever, but not letting the President march down the House Floor until we pay people first is ‘a new low.'" Huh? Graham publicly feuded with Trump over his Charlottesville comments. How do you try to condemn Lindsey Freakin' Graham for being overly servile to the president, and land on one of the few issues that led Trump to respond, "Such a disgusting lie"? Even the petty things she gets wrong (and so of course, I'll come off as petty for pointing this out). She went on a tear about a Hannity segment about her policy aide, tweeting "I also love that such an Official TV News Network™ called him ‘policy guy' as his official title. What are they trying to do, compete with the Daily Show?" Okay… but in the screenshot she posted, you can see Fox News didn't call him a "policy guy," they displayed a headline from another outlet that did. That's just standard operating procedure. When five of six Politifact rulings are False or Pants on Fire and every single WaPo fact-check finds an error, maybe Ocasio-Cortez should do some soul-searching about who's really to blame. This entry was posted in Politics and tagged Alexandria Ocasio-Cortez, Fact Check, Politifact, The Washington Post. Bookmark the permalink.